Definition at line 47 of file timestamp.c. Referenced by time_enter(), and timestamp(). Definition at line 43 of file timestamp.c. Definition at line 46 of file timestamp.c. Definition at line 44 of file timestamp.c. Definition at line 39 of file timestamp.c. Definition at line 45 of file timestamp.c. Definition at line 33 of file timestamp.c. Definition at line 226 of file timestamp.c. Definition at line 189 of file timestamp.c. References BIND_FOUND, bindhash, BINDING, _binding::flags, HASHDATA, hashenter, _binding::name, newstr(), p, and time_progress. Definition at line 70 of file timestamp.c. 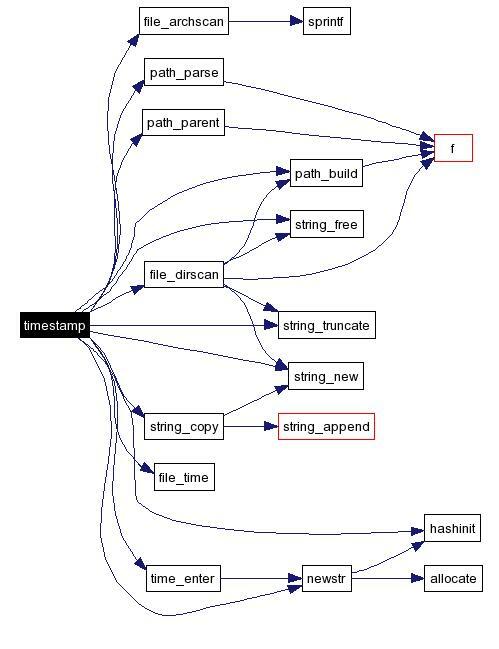 References BIND_FOUND, bindhash, BINDING, file_archscan(), file_dirscan(), file_time(), _binding::flags, HASHDATA, hashenter, hashinit(), _binding::name, newstr(), p, path_build(), path_parent(), path_parse(), PATHNAME, _binding::progress, string_copy(), string_free(), string_new(), string_truncate(), _binding::time, time_enter(), and string::value. Referenced by search(), and search_for_target(). Definition at line 52 of file timestamp.c. 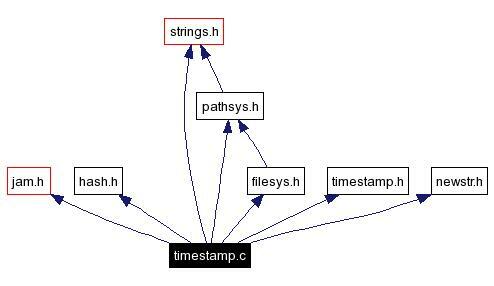 Referenced by donestamps(), time_enter(), and timestamp(). Definition at line 55 of file timestamp.c.